An interdisciplinary area on nanobio-engineering is explored and developed by integrating materials science, chemistry, biology, and medicine. 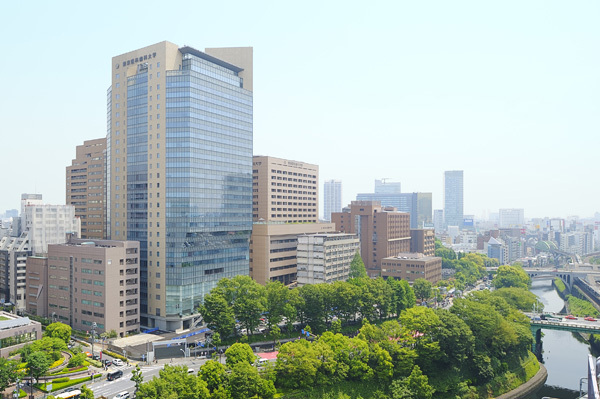 Novel biocompatible materials and functional bio-devices are used for regenerative medicine, cell therapy, minimum-invasive surgery and clinical diagnostics. 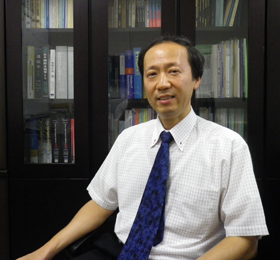 In the group of Yuji Miyahara at TMDU, a direct interaction between biomolecules and carriers in semiconductor materials (electrons) has been investigated for developing novel label-free biosensors. For this purpose, we currently use an insulated gate field effect transistor (IGFET) in combination with organic functional membranes. FET is one of the most important and fundamental devices in the integrated circuit (IC). In the case of FET-biochemical sensors, species to be detected and its selectivity can be determined by the materials formed on the surface of the gate insulator. Previously, ion sensors, biosensors and oxygen sensor have been developed using polymer membranes, immobilized enzyme membranes and a solid electrolyte thin film, respectively. We have been investigating an electric detection of biomolecular recognition using a biologically coupled field effect transistor (bio-FET). The principle of bio-FET is based on potentiometric detection of changes in charge density that are induced at a gate insulator/solution interface by specific recognition of charged biomolecules. In this scheme, the charge variation upon specific binding is directly transduced into an electric signal by the field effect. Based on this principle, we have been developing functional bio-FETs as a new toolbox for biosensings and diagnostics. Our research activities can be categorized into the following research topics. Genetic analysis: Changes in the charge density of the gate as a result of DNA-DNA hybridization on a solid surface is transformed into potentiometric signal using an FET device. Single-base change could be detected using primer extension reaction on the gate of the FET. We successfully demonstrated single nucleotide polymorphism (SNP) detection and DNA sequencing using ISFET. Carbohydrate detection: Carbohydrate detection is based on affinity between phenylboronic acid and carbohydrate such as sialic acid. Self-assembled monolayer (SAM) of phenylboronic acid was formed on the surface of a gold thin film. Potential response of the gold thin film was dependent on the sialic acid density at the cell membrane. Lipid bilayer detection: Uniform lipid bilayer is formed on the surface of the insulator of a field effect device by vesicle fusion. Charges of head groups of lipids can be controlled and detected as a shift of electrical characteristics of the field effect device. Mechanism of signal generation has been proposed. Protein and peptide analyses: The surface of a gold electrode as an extended gate was chemically modified with SAM of alkanethiol with different termini. Potentiometric signal for adsorption of proteins on the SAM layer can be detected and investigated quantitatively. Specific recognition of protein is also possible using antibody and other capturing molecules. Cell-function analysis: Electrical phenomena at the cell membrane can be monitored by the use of ISFET. By culturing an oocyte on the surface of the gate, kinetics of transporter-substrate interaction at cell membrane can be monitored non-invasively. Difference of transporting ability among genotypes of transporter could be discriminated using cell-based FETs. Fig: Human Influenza Virus Recognition by Sugar-modified Conducting Polymers. A new conducting polymer was developed for detecting specific interaction of trisaccharide with hemagglutinin in the envelope of the human influenza A virus (H1N1) by electrical manners. Front Cover of "Advanced Healthcare Materials" in the issue of November 2014. 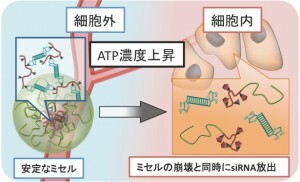 A release of siRNA from the delivery carrier in response to intracellular ATP concentration was observed. There is the JSPS Fellowship for Doctor students. To join us, we strongly encourage Postdocs to acquire JSPS Research Fellowships for Young Scientists. We are looking for Scientists in: Materials Science, Microfluidics, Analytical Chemistry, Organic Chemistry, Electrochemistry, Biochemistry, Molecular Biology, Cell Biology, and MedicalScience. We are looking for academic and industrial partners. Copyright © 2010-. The Yuji Miyahara Group. All Rights Reserved.